The Sport Series Canopies offer slanted legs for stability. The frame is constructed of tubular steel with high performance synthetic joint components and is bonded with DuPont thermoset baked on powder coating to prevent chipping, peeling, rust and corrosion. The legs are four-point adjustable for height. The polyester fabric cover is treated inside and out with fade blockers, anti-aging and anti-fungal agents. The polyurethane inside lining is double stitched and seam sealed with waterproof tape for optimal water resistance and drip-free seams. 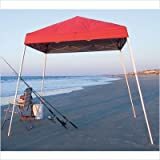 Includes: Full valance fitted cover, Temporary spike anchors, Wheeled storage bag.